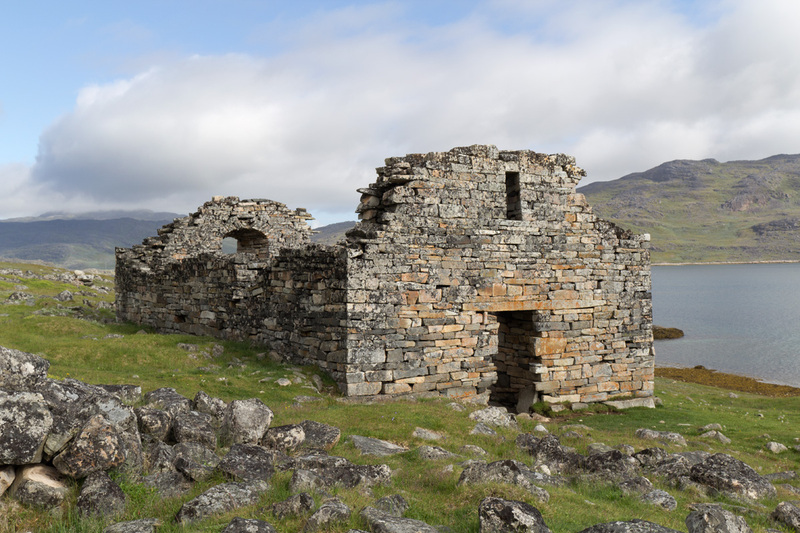 While most of the vestiges of the Viking Age lie in ruins or have been buried underground, a few examples of well preserved structures from the Norse occupation of Greenland still remain standing. The best example is the Hvalsey church, a stone structure complete with all four original walls that include openings for three entrances and two windows. The site of this iconic church, which rests on a sloping hillside pinched between a frighteningly steep mountainside and the stunning fjord, became our camp for five days while we photographed and filmed the restoration of the nearby hall. A document from Iceland that tells of a wedding that took place here in 1408 is the last record of Norse presence in Greenland. 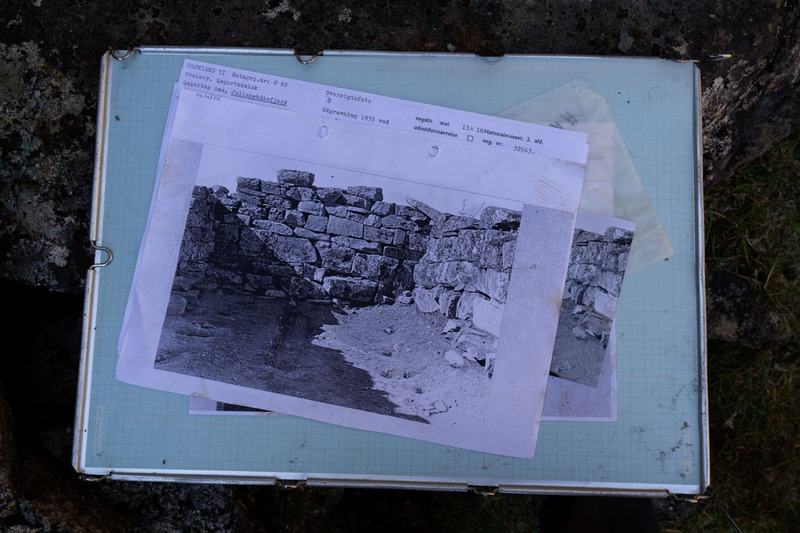 The north wall of the problematic structure had collapsed decades ago, leaving archeologists Georg and Henrik along with Jacob the restoration expert with the task of rebuilding the structure by referring to early 20th century photographs and using the original massive stones which lay strewn throughout the interior of the building. Back in Igaliku, the team has used simple hand tools and straps for the restoration of the unstable stone and lintel passageways, however this job was going to require a little more muscle. As we cruised towards the site in a passenger boat, another boat containing a small excavator glided alongside. The excavator would become an extension of Jacob who used the mechanical arm to lift massive stones, while Henrik directed his incredibly slights movements. Witnessing the process of replacing the stones was like slow motion; it would seem as though nothing was happening until the magical moment when a stone suddenly snapped into position. I asked Jacob how the Norse quarried and moved these stones with no machinery. It wasn’t more of a problem for them than for us, “they just did it” he explained austerely, using technology that we have completely forgotten about. 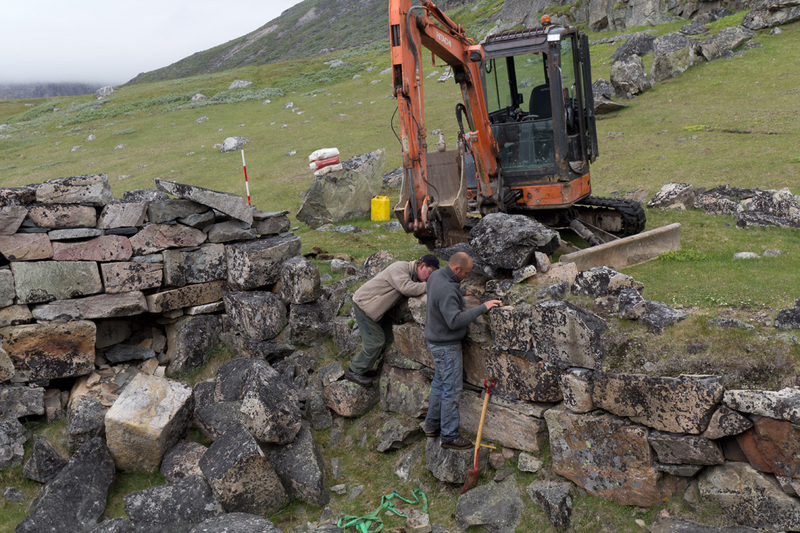 Henrik and Jacob humbly admit that there are very few restoration experts working today – in fact these are the only two currently tasked with saving the Norse Greenland sites. When asked why we should bother reconstructing ruins that have been crumbling for over a thousand years, Henrik explains, “Every time a little stone or two falls, the collapse is continuing. It could take a century, but if we don’t try and stop it…” He trails off, partly because he can’t find the words to describe the loss and partly so that we can take a minute to look and appreciate what we still see today. 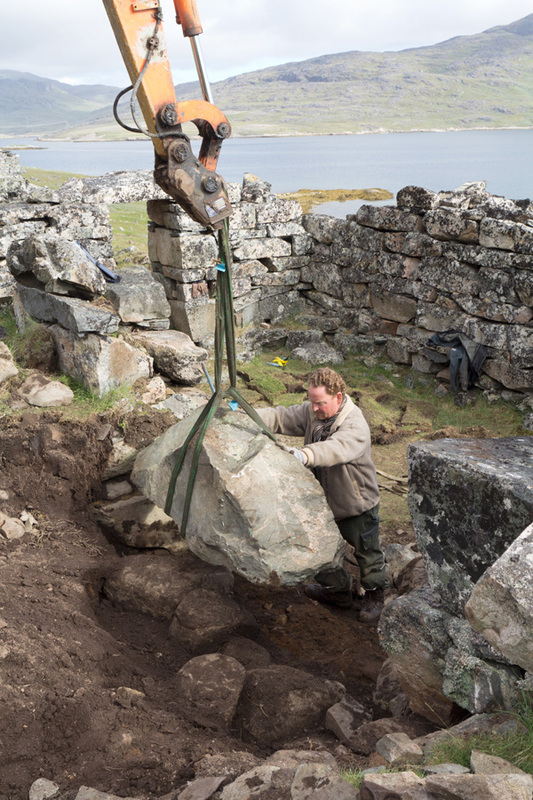 This entry was posted in Archeology, Overview and tagged archeology, camping, Greenland, Hvalsey church, Norse site, Photography, restoration.